Total of 10 pins's- 32-17-106-006,7, 8,9,10,12,13,14,15,16 LENDER OWNED - 1.63 ACRES. Zoned B-1 Retail and business District. Fronts on Dixie and on Ashland. Directly across from St. James Surgical/Well Group Health. Add'l. info under "I" including uses under current zoning classification. Ideal medical related offices. 10 lots back to back-property runs from Dixie to Ashland. 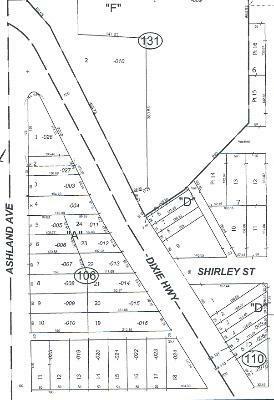 See Sidwell plat 006 thru 016 This property is one time opportunity with the right plan. Mixed use? homes on Ashland commercial on Dixie or visa versa? Just come and take a look and use your imagination!